We were too excited. We did things out of order. 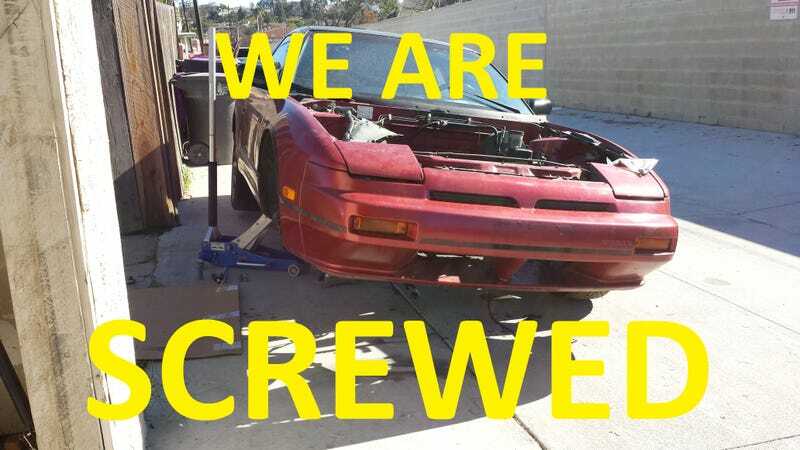 We bought the first decent looking, but mechanically battered 240 we could find on Craigslist for $1000. It was sold to us by a sketchy guy with a “dealer’s license” out of his backyard. He bought the car from a police auction, as the car had been impounded. Why it was impounded was unclear. We thought we were okay, because according to CarFax, the car had a clean title. The seller did not have that title. We bought it anyway, and immediately began to tear into the car. We could clean out the years of filth, but couldn’t clean out the years of regret. The body of the car looked so nice for it’s age. Why was the underside so appalling? Did we knowingly ignore all of the problems? 100 feet: the combined length of all of the speaker wire we found securing vital components to the car. No matter, we shall remove everything. Interior: Out. Engine: Out. Transmission: Out. Suspension: A work in progress. We had plans, and were moving fast. It had been over a month since we bought the 240, and we had yet to go to the DMV. In our area, no DMV’s are open on the weekends, and for one reason or another, none of us had managed to take a day off work to go and handle the registration paperwork and everything else we needed to do to get the car drivable. We knew that the car had a missing title, so we printed off the California DMV forms to apply for a replacement. Daud managed to get to the DMV to handle the paperwork. It was now clear why the car was impounded. The previous owner had been driving around on expired tags and got picked up by the police. The car had not been registered since 2007. The car had accrued 9 years of registration fees, and back fees totaling over $686, and it needed to pass smog before they would even allow us to do that. We had already pulled the drivetrain from the car and sold it, needless to say, it wouldn’t pass. Even if we did have the engine, it wouldn’t pass due to the copious shoddy “repairs” that one of the previous owners had done. If we did a “special smog” that happens in sketchy neighborhoods, it would be at least $250, on the low end. We only paid $1000 for the whole car, when it was in one piece. The guy we bought the car from must have found out all of about this because he never registered the car in his name, and instead immediately resold it to us. It was a short sale, something that is very illegal in California. We couldn’t apply for a replacement title until the fees were paid. We couldn’t update the registration to show us as the legal owners until the fees were paid. The phone number of the guy who sold us the car was no longer valid, and the place where we bought the car from the guy was over 60 miles away, with only a vague recollection of where that actually was. We had a bill of sale, and the shell of the car, waiting for the engine and transmission swap. To add insult to injury, we couldn’t apply for expired registration relief, or an abandoned vehicle title, because the DMV told us that it was known negligence in that we bought the car as is and didn’t investigate further before buying. We tried three different DMV’s to see if any of them would have leniency on us: the last one offered to knock the registration fees down to $600 if we paid immediately. The next few days were tumultuous, as our small group milled over what to do. At first there was the race car option, where we keep the car, not pay the fees and use as non-street driven track weapon. That was quickly thrown out the window, none of us had a truck, or a trailer. We could pay the fees, but once we factored in the cost of paying for a special smog to get the car with no engine to pass, it would cost almost as much as the entire car. We can’t just end the project now, we had accrued so many 240 parts. Eventually we all agreed: we had to get rid of the car. We listed the car for sale as-is, with full transparency about the state of the car, for $500. We had made some money selling the engine and some spares out of the car, and with the $500, we could hopefully only be out a little bit of money. Oh how did the online commentariat mock. We got offers for $50, and $100, and others just told us how stupid we were to ask for money at all for the shell. After about a week of online denigration, we had had enough. This shell had a clean title, and a straight body with original paint, it was obviously worth something. We went through all of the Facebook and Craigslist ads, deleting all of the information and instead replacing it with the words “part out.” Funnily enough, after a week of being berated for posting our car for sale, there was immediate interest in those precious body panels with original paint, and everything housed inside of them. Much more on this later. While this was happening, we were looking for a new 240. Something that could be the recipient of all of the parts we had accrued over those two months. In an effort that could only be described as “complete Stockholm syndrome.” we returned to Craigslist, and Facebook, and searched for the “perfect” 240. Of course, we are using the term “perfect” quite loosely, some would say in a manner more loose than a vindictive ex-girlfriend at a liberal arts college. We found one. Rather, Julian and Daud found one while I was at an autocross, asking questions via text in between runs about the jalopy that they had found. Did it run? No, of course not. Why didn’t it run? Good question. Does it have a clean title? Yes. Do they actually have the title? Yes. Does it owe registration fees? Well, yes, but not much! How does it look? Like a complete pile. Perfect. $900 and one free AAA tow later, this was pushed into the backyard. Oh, come on, it’s not as bad as it looks. Actually, that’s a lie, it is terrible. - It is an original manual transmission car, so that saves us the hassle of swapping it. - It was originally a single cam KA24, but that motor had long since blown, and been replaced with a later, dual cam KA24. - The car had been in several accidents. The rear floor pan and bumper mounts are wrecked. The front panel gaps are terrible, and the every panel on the car needs a lot of bodywork. - Crummy half-done flat black rattle can paint job. I think it’s indicative of being too deep in the 240 game when I didn’t include “had to be towed home” in the con section. Pray for us. The previous owner was a younger kid who bought the car, had engine troubles and then squirreled it away in a garage. It apparently hadn’t run in two years because he couldn’t figure out how to get it started. Oh boy. For once, a light shone down upon us, and trumpets played as the 240 angels looked lovingly at our pile of garbage that was once a car. All it took was a battery, realizing the flange for the starter was damaged and mounting bolts needed tightened, and some fresh gas to get it going. Someone sure is proud of himself for bringing that $900 beater into our back yard. So, in case you had not fully grasped the situation at hand, we now have two, terrible, god-awful in every way 240's in our backyard, each with it’s own set of problems. Additionally, we now have enough spares and miscellaneous sharp, heavy, and/or pointy metal things to effectively build another 240. I felt safer driving a Mazda Miata with the top down, at night in Compton, than walking barefoot through our back yard. Brilliant. And here is where we will end Part 3, as always, with everyone questioning our collective sanity, but more importantly with one good looking car that no longer has a powertrain, being scrapped for parts; and now another car, that looks appalling, being heralded as our for now-running savior. God help us, all. Jake Stumph is a certified car nut and track day bro. He is prone to making bad financial decisions with cars, and is known to enjoy rolling 3rd gear burnouts. That said, you should follow him on Facebook, or YouTube. Why? Because he managed to write this bio in the third person and not break character.